Aloha and Thank you for visiting the Sea Wizard's Magical Domain! The Sea Wizard is a very Mysterious Wizard who enjoys many a playful prank and wonderous visual adventures for you to enjoy. Please stroll through the pages and enjoy the many enchantments he brings to his visitors, with poetry and quotes, the fantasy realm and indian world. The Wizard's mysterious domain insists that you enter through the sacred temple of your heart. You, who are divine by nature will understand that his password is Aloha. 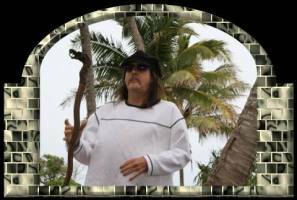 The Sea Wizard would love to have you visit his guest book and share your poems and inspirations with him, as he will open your heart with his mystical dreams. Everywhere the Sea Wizard goes, so goes his soul crew. His soul crew are the many soul mates he has on the other side of this life. They shared in his laughter and his lightening-quick wit! When you live in other worlds, such as the Sea Wizard does, you are often misunderstood. So before you enter his fortress, take a oath of innocence and trust. Open your heart and breathe in the essence of understanding. See with the eyes not made blind from this world; eyes that form a vision from dwelling within a thinking heart;, hear with ears that know the silence of nature; speak with a voice that understands the song of the birds. Enter from a secret passage in your soul that sings along with the melodies of spiritual life! How lonely the Wizard often is, living in the material world, where the mind dominates the heart, where LOVE is not the KING! The Wizard does not like rules, they constrict a free being. 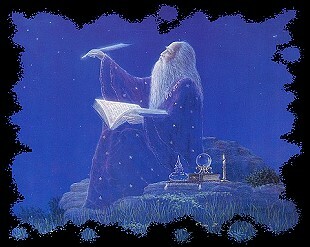 As a holy child of the universe, the Wizard spent his childhood as a shepherd. He tended his sheep and learned to love them as himself. How difficult life felt as he learned of the cruelties of the human existance. He quickly learned to escape into other worlds of fantasy and joy. You could see him as a small child frolicking with the small sheep, communing with the working dogs and cultivating the soft and gentle side of his being. BUT Life became hard and brought pain, but throughout the pain and suffering the Sea Wizard never lost his sweetness. He cares not much for the material world, he is a living example to his family of the sweet purity of spirit. A spirit uncontaminated by the greed of a world gone mad. This Magical Wizard is loved by many yet misunderstood by a world without a heart. Although its easy for a gentle soul to get lost in a crazy world, the Sea Wizard has come through his life with his spirit intact. He has always remembered that LOVE is worth striving for. HE HAS NEVER GIVEN UP ON LOVE. After all is said and done, isn't the belief in LOVE the final victory over the darkness that this world tries to pull a child of innocence into? Please continue to visit the Wizard's Realm, for this is just the beginning of his blooming garden in cyber space. Enjoy your journey. The Sea Wizard understands and loves all of the water on our planet. Water is a mysterious and holy gift from God. To see some very fascinating proof of this and of the power of thoughts, the Knowledge Gallery presents an exhibition titled Wisdom From Water by Masaru Emoto, demonstrating the actions of thought and word energy on water by photographing the water crystals with a special technique. Some examples are below. "you make me sick. I will kill you!"